Though there are far better airline cards for business owners, frequent flyers of American Airlines will find plenty of value in the CitiBusiness / AAdvantage Platinum Select World Mastercard to justify the card’s high annual fee. While CitiBusiness / AAdvantage Platinum is not as valuable as it used to be, it is still a great avenue for collecting miles on the ground if you run a small business and fly American Airlines. With a generous sign-up bonus, free checked bag, decent earning scheme and other benefits, the card offers enough perks for you not to feel ripped off by the $99 annual fee (waived for the first year). The CitiBusiness / AAdvantage Platinum Select World Mastercard is currently offering 70,000 American AAdvantage bonus miles for cardholders who spend $4,000 in the first four months. That’s a very generous number of miles, on par with some of the best sign-up offers currently available from other airline cards. It amounts to two round-trip flights in North America, or one round trip to Europe or Latin America during off-season. Like many other airline cards, the CitiBusiness / AAdvantage Platinum Select World Mastercard pays double miles for eligible American Airlines purchases. It also pays double miles for telecommunication spending, car rental purchases and gas station purchases. Throughout the year, you can take advantage of quarterly award sales featuring up to 30 percent discounts between select city pairs. Your CitiBusiness / AAdvantage Platinum Select World Mastercard comes with a set of tools to help you manage your business. You get some standard features, such as the ability to set and change credit limits for employee cards, as well as the ability to track expenses in quarterly and annual summaries. But the card offers more refined benefits too. You get access to a personal business assistant to help with travel arrangements, and you get immediate access to small-business customer service specialists. Even when you have enough AAdvantage miles to book a flight, you might not find Off Peak or MileSAAver award availability for the date of your choosing. And when there is availability, it might not be the most convenient routing. For flights to Europe, you might only find availability on a partner airline that adds huge carrier surcharges (fees charged on top of the base fare), such as British Airways. If you are not flexible, redeeming your AAdvantage awards can be a bit tricky. 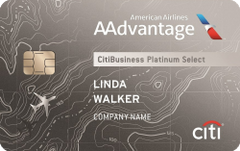 Why get the CitiBusiness AAdvantage Platinum Select World Mastercard? American Airlines is your primary choice of air transportation. You spend a lot of money in the bonus categories. You have a lot of employees to help you collect miles (since there are no fees for employee cards). You want a mile boost from the sign-up bonus. You value extra benefits, such as free checked bags and priority boarding. Charge everything to the card that falls within the bonus categories unless you have other credit cards that offer a higher rewards rate than 2 miles per dollar. Pay cash for cheap flights and save your miles for flights that are more expensive. Avoid using award levels other than Off Peak or MileSAAver. All other levels are overpriced. Do not carry a balance on this card. If you need to carry a balance, use a low interest rate credit card.